Abstract—Modern instrumentation equipment, commercial & defense communication systems, and radar equipment require excellent stability, extremely low phase noise frequency sources. Testing devices that exhibit phase noise of -120 dBc/Hz at 1 Hz offset from the carrier and better than -180 dBc/Hz on the noise floor is a challenge using existing test equipment and methods. It is especially pertinent to production environment, where measurement time and accuracy of each measurement becomes critical. The purpose of this work was to investigate different test methods, evaluate different phase noise measurement equipment, and find acceptable solutions for both low frequency (around 10 MHz) Ultra Low Phase Noise (ULPN) reference, and HF/UHF ULPN OCXO. Several test methods and test instruments were investigated. There's no "one size fits all" solution, but for each frequency range the optimum solutions were proposed. Reaching the noise floor farther away from the carrier. 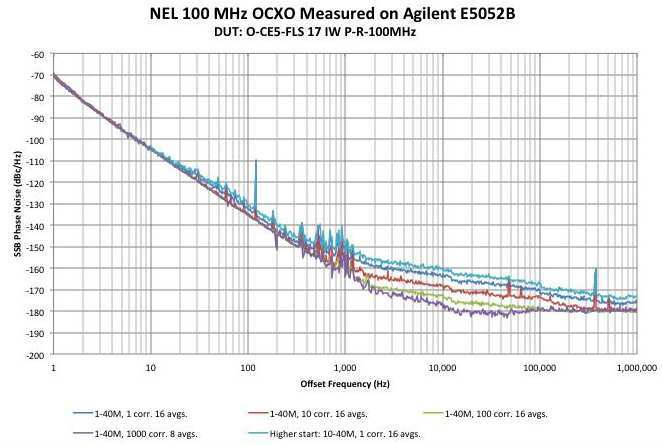 For higher frequency ULPN OCXO, specifically at 100.000 MHz carrier frequency, RF pollution in the environment, and EMI added further challenges. For devices, which employ a phase lock loop (PLL) technique for attaining higher frequency the interaction of the device PLL and test instrument's PLLs made it even more difficult to achieve accurate results. The obvious choice of equipment for testing low frequency OCXOs was Symmetricomm's 5120A Phase Noise Test Set with option 01 (internal reference) , which uses cross-correlation technique. It satisfies the majority of the established criteria, and does not require additional references, nor calibration of the device under test (DUT) on exact frequency. 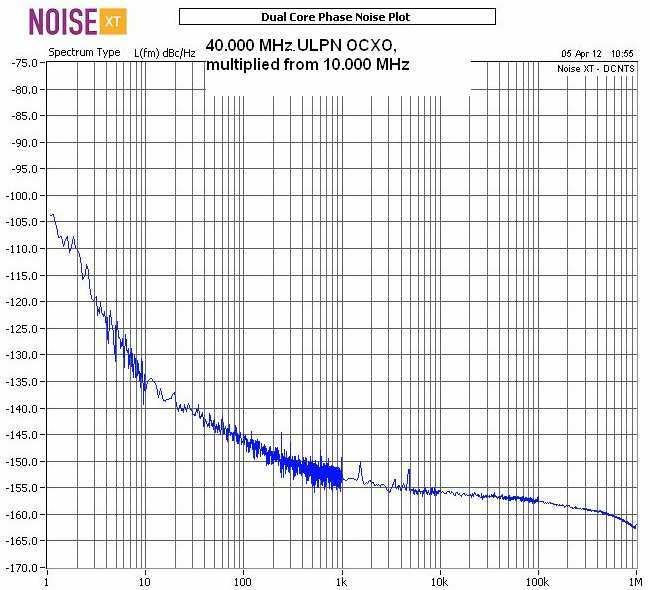 The phase noise plot of 10.000 MHz ULPN OCXO is shown on Fig.1. The only concern was the resolution (noise floor) of the measurement at large offsets from the carrier (the noise floor of the device). 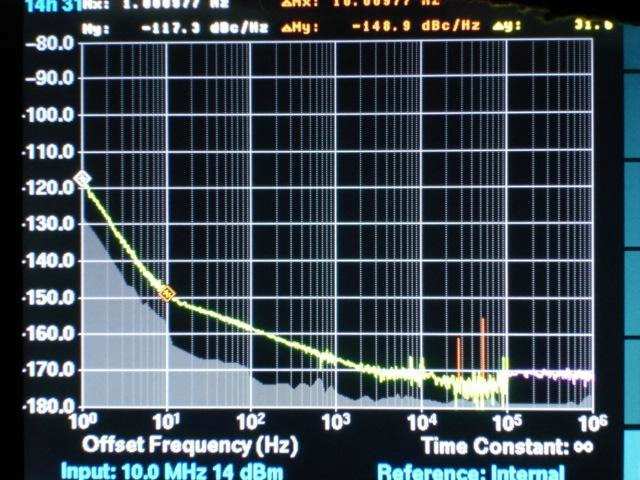 The instrument's specification calls (conservatively) for -168 dBc/Hz floor at offsets greater than 10 KHz. The theoretical expectations were closer to -175 dBc/Hz at 100 KHz offsets and beyond. 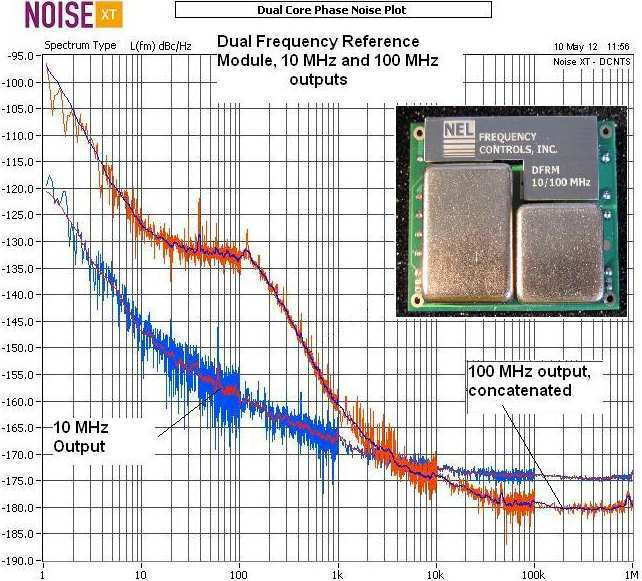 We decided to verify our expectations with a Noise XT Dual Core Noise Test Set (DCNTS) , . It is a considerably more difficult type of test. It requires two references with similar performance as the DUT (the better the references' performance – the faster the test), the references must have voltage control (ability to change frequency with the change of the voltage on the control terminal), and be calibrated exactly on the frequency of DUT. The test result of the same device is shown in Fig.2. As expected, the measured phase noise far from the carrier was improved by 3 – 5 dB, while discrepancies in results from a few KHz offset in were not very noticeable. Realizing that the phase noise on the noise floor is determined by the circuit, and for given design unit to unit variations are negligible, the instrument of choice still would still be 5120A-01, however, during the design qualification stage, the verification of the noise floor values on the DCNTS is required. There's no ideal option to satisfy all established criteria. We started with presumably the most accurate and fastest instrument – the DCNTS from Noise XT. The first results were surprising and the plot is shown in Fig. 3. Fig. 3. 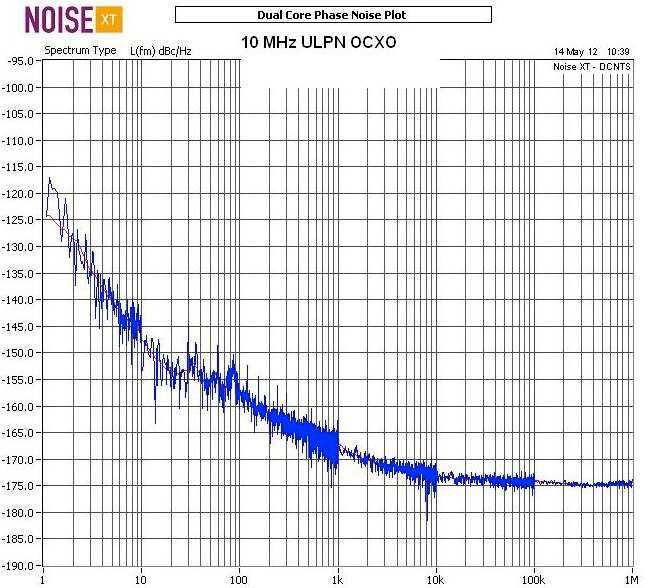 100 MHz ULPN OCXO with "bumps" caused by RF pollution. All power supply cables were shielded and connected to the test fixtures via SMA connectors. We built RF shielding cage and placed all test equipment, including power supplies and test fixtures inside the cage as shown on Fig. 4. Fig. 4. RF shielded test station. We tested the unit whose phase noise plot is shown in Fig. 3. with the improved setup. The resultant plot is shown in Fig 5. We also included the plot (as a courtesy of Guillaume De Giovanni, Noise XT) with data taken on a batch of ULPN OCXOs in a benign (RF pollution-wise) environment. The test instrument is the same DCNTS with the "smooth" function used. It's shown on Fig. 6. Fig. 5. 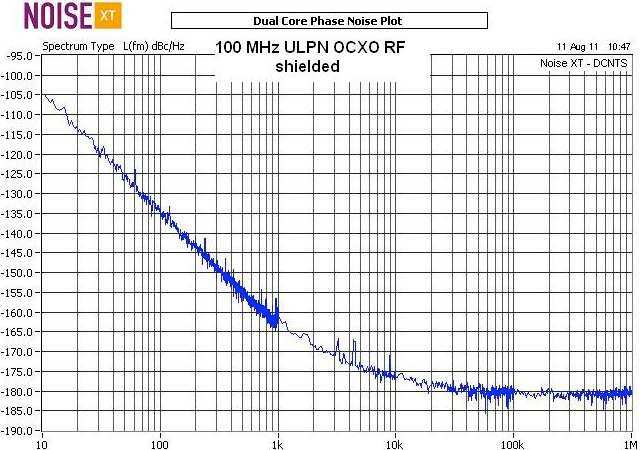 100.000 MHz ULPN OCXO phase noise tested with RF-shielded setup. Fig. 6. A batch of 100.000 MHZ ULPN OCXO tests in benign environment. Smooth function is used. From the ease of use standpoint, a very attractive option is Agilent's E5052B Signal Source Analyzer . Also testing was performed on the device, similar in performance to the one shown in Fig. 5. using the E5052B. The instrument utilizes built-in synthesizers and the cross-correlation method. The plot of the experiment with varying numbers of cross correlations and averages is shown in Fig. 7. As shown in the plot, the instrument can resolve the performance of a ULPN device with sufficient number of cross-correlations, but unfortunately it takes an enormous amount of time to do so. One would have to run the test for several hours to get the noise floor of the instrument at all offset points low enough to achieve an accurate measurement. That would rule out the use of the instrument in production environment, but it still maybe useful in R&D, since it doesn't require additional references, or calibration of the references and devices (setting on exact frequency), etc. 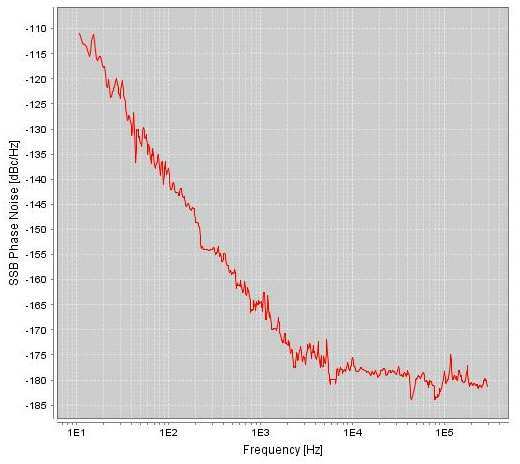 If the performance on the noise floor of the device far from the carrier frequency is the only parameter needed, the measurement time can be significantly reduced. Fig. 7. 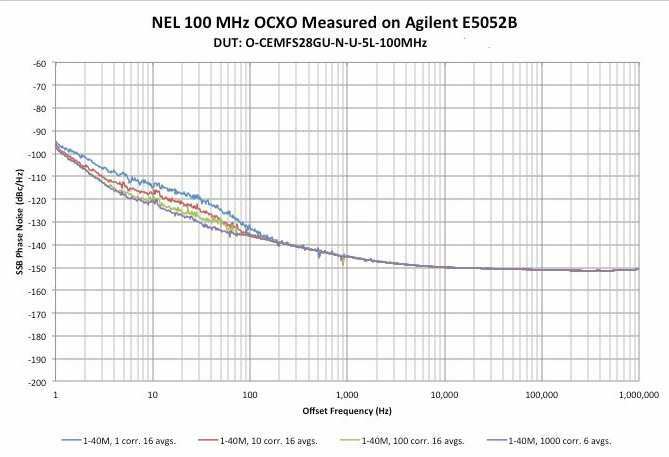 100 MHz ULPN OCXO tested on Agilent E5052B with different number of cross-correlations and averages. From a cost standpoint, there's one new little instrument made by Swiss company Anapico APPH6000 . It doesn't have as many options and capabilities as the DCNTS system, and is still in the process of improving GUI and firmware, but it tests reasonably fast and can be used successfully in production. Test results are not as presentable as other instruments, but acceptable. Example is shown on Fig. 8. 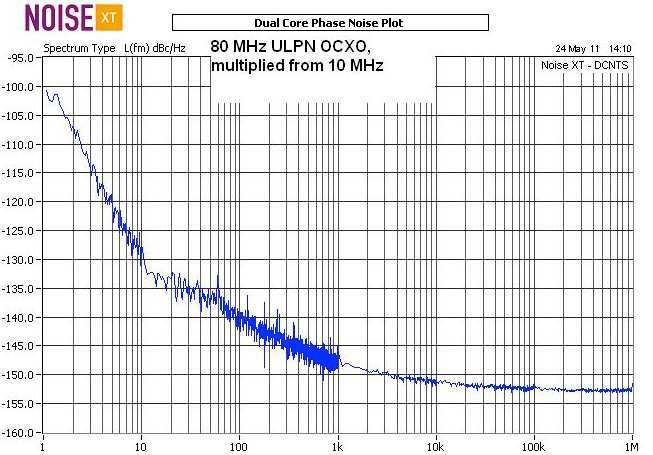 We tested several ULPN OCXOs, which employed analog harmonic multiplication, with references ranging from 10 MHz to 100 MHz and multiplication factors from 2 to 15 on the DCNTS from Noise XT. The instrument handled tests without problems and some of the examples are shown on Fig. 9. through Fig. 12. We also tested one of those units (100.000 MHz, multiplied from 10.000 MHz) on the E5052B with different number of cross-correlations and averages. The plot is shown on Fig. 13. As when testing ULPN devices with no multiplication, despite the ease of use, the speed of test required to achieve meaningful resolution is not acceptable for a production environment. With 1,000 cross correlations it took over 2.5 hours for the first trace (1 average) to appear. To achieve "the best of the both worlds" i.e. 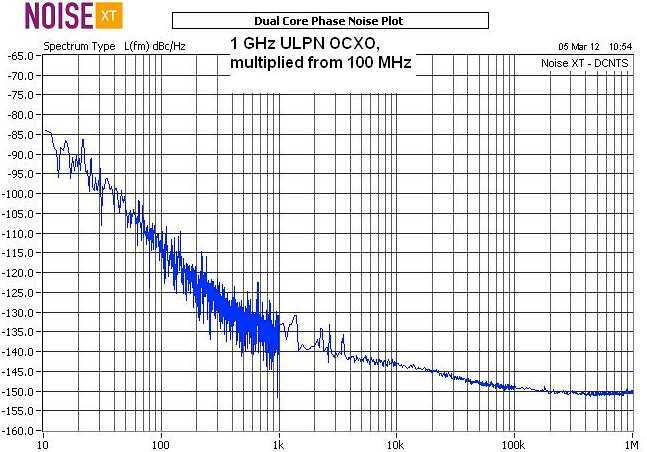 combine the best close to the carrier phase noise, short term, long term, and environmental stability of the low frequency (10 MHz) ULPN OCXO with the lowest phase noise on the noise floor of high frequency (100 MHz) ULPN OCXO, the latter is locked to the former in a low noise PLL, as it is done in NEL's dual frequency reference module (DFRM). Testing of the 10 MHz output can be done as described in chapter I, without presenting any additional challenges. It is much more difficult to achieve realistic test results on the 100 MHz output while testing with two other DFRMs as references. The interaction of internal PLLs with instrument's PLLs along with necessary filtering on control ports of the modules creates artifacts in the phase noise plot, which make the data mostly unusable. The only solution we found so far is to make to test runs for different offset ranges, with different references, and concatenate them afterwards. The result of this effort is shown on Fig.14. 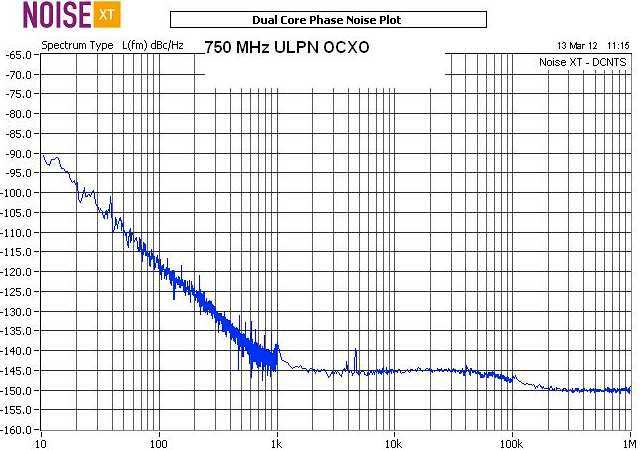 For higher frequency offsets we used nonmultiplied ULPN OCXOs at 100 MHz as references. They were free running with voltage control used by the instrument's PLL. 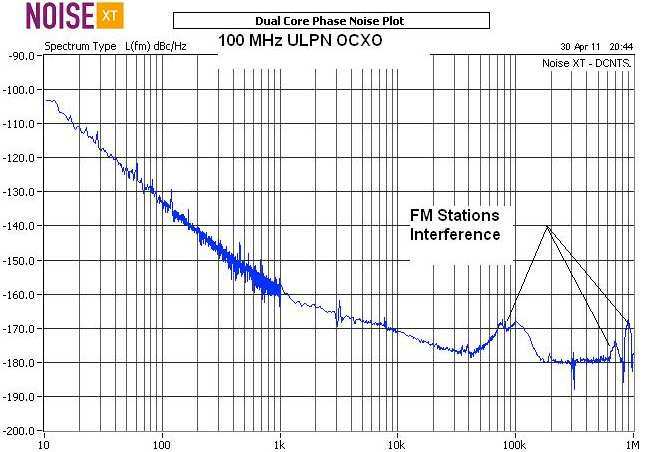 For lower frequency offsets we used a ULPN OCXO at 100 MHz, which were harmonically multiplied from 10 MHz, as references. 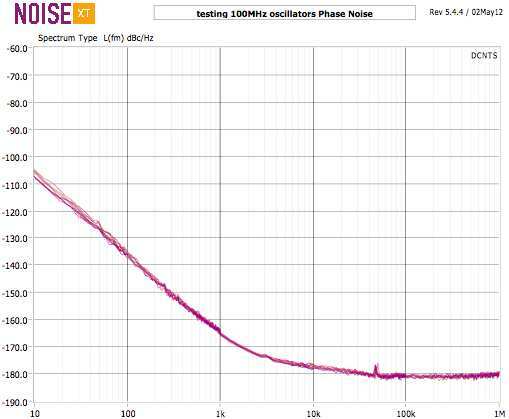 The splicing point is at 100 Hz, just below the internal PLL loop bandwidth. 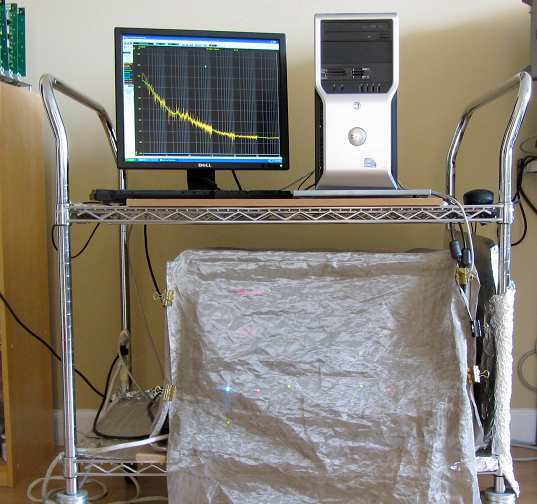 Testing phase noise of ULPN OCXOs requires using the cross-correlation technique. Special care must be taken for reduction of RF interference, especially while testing 100 MHz ULPN OCXO in the vicinity of strong FM broadcasting stations. The choices of readily available equipment are limited, and the instruments are suited differently to different types of DUTs and different purposes of test. Our rating of evaluated instruments is presented in Table I. We want to emphasize that this is applicable for ULPN devices only. We had very little experience with the Rohde & Schwartz signal analyzer, but expect that it would rate similarly to E5052. Rating is 1 to 5, five stars is being the best, one - the worst. 1. For E5052B the accuracy is good after very long test time. 2. For 5120A-01, the resolution on the floor is insufficient. 3. To achieve accurate data. Authors would like to thank Guillaume De Giovanni from Noise XT for support in better understanding DCNTS operation and providing test data, and Dr. Jakub Kucera from Anapico for support and updates. F.L. Walls et al. Extending the Range and Accuracy of Phase Noise Measurements. Proceedings of the 42nd Annual Symposium on Frequency Control, 1988. G. De Giovanni, M. Chomiki. New Phase Measurement Techniques and Ultra Low Noise SAW Oscillator. Proceedings of IEEE International Frequency Control Symposium, 2010, pp. 116 – 118.